Hello, Ribbon Lovers! It's Kathy here with another fun card for fall. 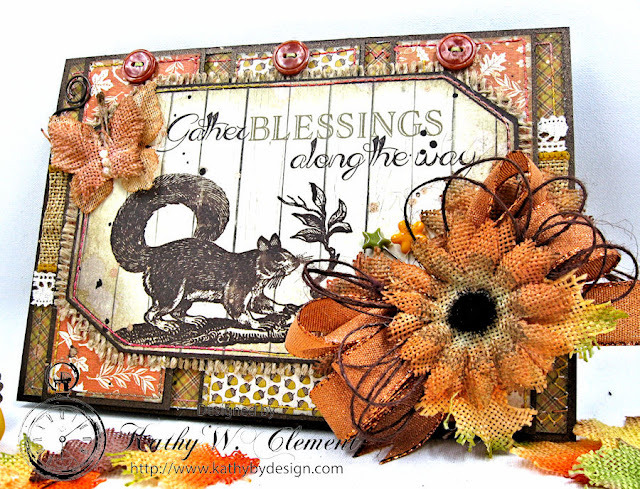 I just love the colors and textures of fall, so I added lots and lots of both to this card made with Authentique Harvest papers. The combination of humble burlap, homespun Debra crochet lace, and rustic brown burlap string with Copper Glitz Ribbon is a real winner in my book! The belly band was created with Antique Gold wired edge Burlap Ribbon. This is no longer carried by RRR (insert moment of silence here). BUT you could easily get the same great texture by substituting either Antique Gold Netting or Brown Netting. Of course, I tied that bodacious Copper Glitz bow with the aid of my trusty Bow it All Tool! It's a must have item in my studio! To learn how to make the most of it in your craft space, you can subscribe to the Really Reasonable Ribbon YouTube Channel. Bonnie has an amazing array of helpful tutorials there. That's all for me today, my friends! Thanks for stopping by! From Our Web to Yours Happy Halloween! Really Reasonable Ribbon LaborDay 4-Day SALE! Really Reasonable Ribbon 147 Winners!